Every month I tell you about the fabulous kids' clothing subscription that FabKids offers, and it really is terrific. I have friends and family who signed up to get an outift every single month and they love it. I'm going to tell you a little bit about the subscription, but I'm also going to tell you about other options they have to offer. The subscription service is practical, helpful, and fun (who wouldn't love to have a new outfit delivered to their door once a month?). It's easy too. Each month you are charged the price of one outfit to your credit card. The credit for that outfit then goes into your account so you can pick out an outfit of your choice, at your leisure, any time you would like. The subscription service is free. The montly charge (if you decide you want to make a purchase that month) is $29.95. You don't have to make a purchase though!! The choice is always yours. Simply opt out by the 5th of the month to decline (if you are so inclined). Easy peasy. You can cancel your subscription at any time. All new VIP Members are eligible to take advantage of the Buy One Get One Free outfit deal for their first purchase. You Can Make Individual Purchases! FabKids sells tee-packs like this cool set you see above. Yes, FabKids is an amazing subscription service, but they're also so much more. Did you know that at FabKids you can make any purchase, any time? They have a lot of great mix-and-match pieces, great shirt duo kits like the one you see above, dresses, pants, shorts, and even shoes! and they have nice, roomy pockets on the front. The pants are always the best quality!! I have had four kids, and I honest to goodness have never found pants I like more for kids, than the ones they sell at FabKids. Not only are they designed to be stylish and look good, but they're also extremely durable and they wear and wash well. The Classic Cargo Pants you see in the picture above are nice and roomy, but they're heavy-duty too...which means they're comfortable and they're going to last. You get more for your money with any of the FabKids pants. I would buy and/or recommend them to any one, any day. Like all FabKids selections, the clothes are ready-to-play, roomy and the move well with your busy child. Like all FabKids selections, the clothing I am showcasing today is made to play. My son is busy and all over the place (I like that about him). His FabKids clothes don't distract him, and they allow him to move!! They also have fun options like the hood you see above, or the color patch skull you see below. The Patch Skull Graphic Tee is perfect for Fall (and Halloween!). The Patch Skull Graphic Tee is perfect for this time of year when people are breaking out the Halloween selections. More of a cute skeleton than a scary one, but still a skeleton (the first makes mom happy, the second thrills the boy ;) ), this shirt takes your kiddos right into the holiday season with flair. If you haven't seen them yet, FabKids is now also offering a nice selection of shoes for both boys and girls. 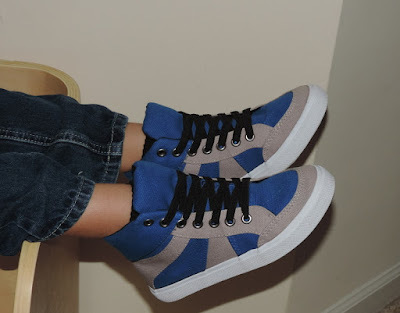 My son loves these ColorBlock High Top Sneakers because he thinks they look cool. I love them because they're machine washable and they have shoe laces but they don't really tie!! My son has several new pairs of shoes and he skips over all of them to get to these, so they must be comfy too. This picture shows my son in his new FabKids shirt, with a pair of pants he got from FabKids a long time ago. They look great together, right? Mixing and matching is easy with the FabKids clothing line. 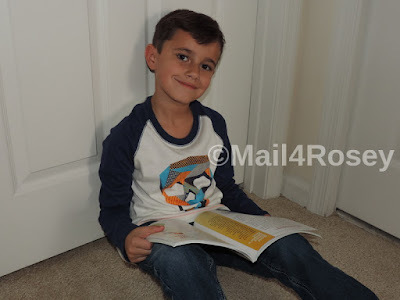 In the picture above, my son has the shirt from the tee pack I described above (note: you can buy the shirts as separate pieces too), mixed with a pair of FabKids jeans we ordered a loooong time ago. They look great, right? And they've been worn and washed a lot. Like I said, those pants really hold up. We love the FabKids monthly subscription service, but we appreciate the option of being able to order separates when we need them too. FabKids does a great job at meeting all of our clothing shopping needs. I'll be including them in the Mail4Rosey Holiday Gift Guide this year too, because I think the subscription service is a great gift idea. The clothes rock and your son is most handsome. OMG, he is getting so big! He is adorable in his new duds! Love that skull shirt he has on. And hurray for pants that hold up really well. It seems that we are forever replacing jeans around here! I love those Classic Cargo pants! I would have dressed my son in those when he was younger. 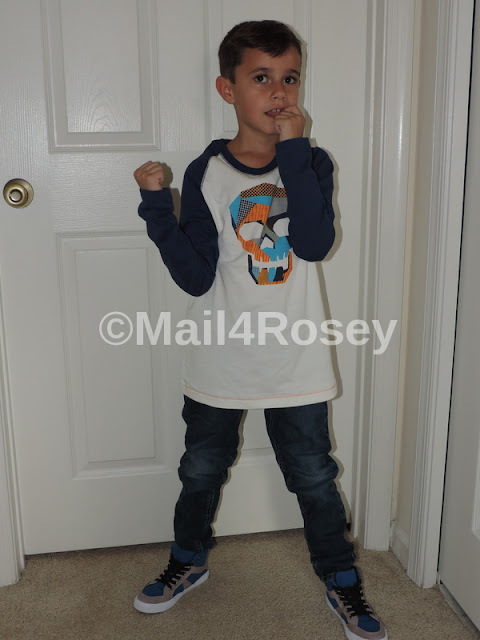 I love Fab Kids Clothing.. especially for boys! Such a great selection. 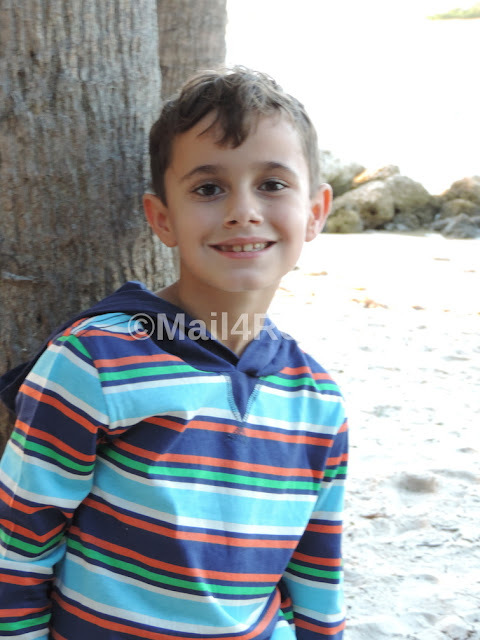 Your little man is so cute! I love Fabkids. Their clothes are so snazzy. Oh my goodness, you son is the cutest. He looks so handsome in his clothes. I'm LOVING those pants. What a little man. I just heard of this company a few weeks ago! I will be shopping there as soon as kiddo needs more clothes. You son is adorable by the way. Now a clothing subscription is definitely something I would like! Me and my son both love clothes! This sounds perfect for keeping the kids' wardrobe up to date. I'd love the ease of having high-quality clothes arrive any time! Love those outfits. Especially the bright blue... a favorite color of mine. I think I know where I will go to find something for my Nephews b-day. There's already a subscription for children's clothing?! That's new, at least for me. This is exciting because my daughter loves dressing up! Now she can have new clothes to try and wear! Will look into this sub. Thanks! Your son is so cute! I love the pants -- they look so good on him. Really adorable clothes, I love seeing your selections to get ideas for my grand kids. From head to toe he is sharp looking. I love this idea! They do this for women why not for kids?! such a convenient service especially during Christmas season when you need to shop for clothes yet want to avoid the shop crowd! Your son is such a handsome model. I have bought some kids clothes from them once. What a neat idea. They look like they are good quality too. Wow- I didn't know about this service. Sounds and looks great! He is looking good. So handsome and so grown up. If the twins were younger, I would also sign up at FabKids. I like the outfits you feature, I think the quality is good. These clothes are adorable! Just the perfect mix of "still cute for little kids" while also being "cool enough for big kids". Love it! Fab kids clothing is awesome. Nice and perfect for my nephews. Always good when clothes can last indeed and able to move in them is a big plus. What a handsome model you have! I love these fashions, they look comfy! Love Fabkids! I have gotten a few outfits but not the shoes yet - nice to hear your opinion on them! I have heard great things about this subscription. May have to try it myself. I was a member of FabKids for a few years. Then she outgrew the sizes they had. It was a great ride while it lasted. Love the clothes. What a great idea! You always get such great clothes. He looks very handsome! What a neat service! And your kiddo looks like he's gotten taller recently! These subsciption programs are everywhere. I did not know they had them for kids clothing. FabKids really offers some very high quality children clothing. I like that they have a multitude of styles to choose from. I didn't know that FabKids has a subscription box. I will check this out. Wow this is new to me. I think its a brilliant idea. We always shopping for kids, this makes it convenient. Awww your son is so cute and those clothes look awesome. I love the idea of this subscription service. I love his look...comfortable and casual, but still with color and style. Fabkids is a great kid's clothing resource! These are nice clothes. I love the designs and they look comfortable. Boy does your son look sharp. These are really quite stylish and I love the shoes. I've been considering a few pieces of Fab Kids for kiddo to try. She is just about out of 14s and can wear 16s and XS ladies now so I am not sure if they have a lot for her. It's probably a lot easier than to get boys out to shop for clothes. /what cute clothes. I love fabkids and their other companies. These are great clothes for boys. Very different yet very boy like. That's hard to find. My boys would have loved the sneakers. He looks fabulous! I love the cargo pants. My son would love those, too. What a great service and such cute clothes. If my kids were just a few years younger! You always get such cute clothes! I need to try this out. Love the clothes and the combinations! So cute and comfortable! Nice Service at his age it's hard to find the best outfit for him so this is such a good one. Loving the new kicks! 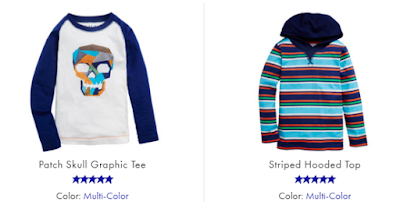 This company always has great style for kids! My daughter would love this. She is a total fashionista and every day she runs to check the mail to see if there is anything for her. Talk about two birds with one stone … I’m thinking Christmas present! Thank you for introducing me to this fun subscription. I love those sneakers! My daughter is super tiny, and finally fits into FabKids' smallest size! The clothes looks so nice! I especially like the shoes and the striped shirt. I've been hearing a lot about FabKids lately! I'm going have to check them out sometime for sure. He looks so handsome. Fab kids is pretty awesome. Such cute clothes. I had ordered girls clothing from FabKids but never boys before. I need to get this for my son! Looks like you got some pretty great stuff! These boxes are all the rage right now! The outfits look super comfy! We love Fabkids clothing so much as they come up with some unique collections for every season. Your son looks very cute in those outfits & I love that cute pair of shoes as well. I love the sneakers your son is wearing. It looks super trendy. I need to check Fabkids out. I have ordered some stuff from here for my daughter. They have adorable stuff! He is so cute in these clothes! A perfect ambassador! If I had the money I would do it for the kids. Oh and he is growing up Rosey!!! A subscription service for clothing? How interesting. At least you will always have the latest fashions! Such cute outfits. I wish my girls could wear clothes from there but they have outgrown them. They really have cute outfits for kids. Loving the shirt colors for fall! My son needs new shoes. This sounds like a great way to try the service out and see how the shoes are. He looks like he is growing like a weed! I love the clothes you always get from FabKids! Wow! I had no idea that there was such a thing. How convenient and easy!